Since the PV is a beach PV, I should probably judge it as such right? 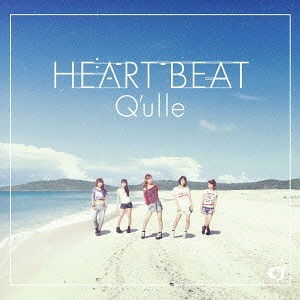 Well, actually “Hearbeat” strikes me as the kind of release that attempts to play too many angles. The music hits heavy with distorted guitars and booming drum fills, but the melodies play like a nursery rhyme complete with a call-and-response chorus. OK, the song is more complicated than “Farmer in the Dell”. Like the PV, which takes you to the beach but does not let you swim, the composition brings the rock, but refuses to smash you on the head. In a sense, I can’t blame the girls for wanting respite from their career trajectory. “Heartbeat” reminds me that Ikura, Yuzuki, Yakko, Manako, and Maamu come from a background of dance covers and vocaloid tunes. The work and music of Q’ulle (thus far) inhabit a world leagues away from the saccharine and Hi-chew world of dance covers. 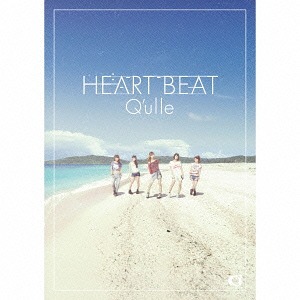 Looking at it this way, “Heartbeat” serves as the perfect summer vacation from the dark and moody subterranean Q’ulle planet. This single is a postcard from paradise. The fear, of course, is that after “Mic Check One Two” and “Monster”, Q’ulle reconsiders their identity and never returns to their adopted home. I cannot really blame them for this; the role of “unconventional idol” does not afford much comfort nor does it promise much acclaim. Do their professional choices really boil down to either second-rate idols or first-rate nu-idols? Perhaps the girls just wanted to briefly live the daydream of another idol’s idyllic life and will return to kick our asses in the fall. I cannot offer answers to any of these questions.